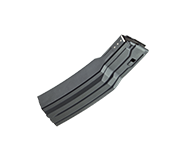 SureFire High-Capacity magazines provide distinct tactical advantages: increased initial firepower in ambush situations; fewer reloads overall, which means less downtime and target distraction in a firefight; fast and easy magazine insertion, even with a closed bolt; less bulk compared to drum mags, enabling a normal weapon grip. The 60-round magazine—slightly thinner than two 30-round magazines clipped together and about the same overall length—fits in most dual magazine pouches, eliminating special carry pouches required for drum magazines. SureFire offers a heavy-duty magazine pouch specifically designed for the MAG5-60 that attaches to a MOLLE system vest.